A powerful partnership has been forged! Heritage Conservancy has teamed up with the James A. Michener Art Museum for “The River Flows Through Art: A Catalyst for Change” educational program. This five-week endeavor, which is currently taking place, creatively teaches students from three local schools (Morrisville High School, Strayer Middle School, and Thomas Holme School) about American painters and conservation of artwork in conjunction with conservation of the environment and the importance of protecting our waterways. What’s the connection between an art museum and an environmental cause? You might be surprised at how well art and conservation go hand in hand! From the artistic angle, part of the project’s goal is to teach the students about different American muralists and landscape painters (such as Daniel Garber and Edward Steichen) and to have them examine their artwork. The students have learned how the murals were restored, and they discussed how a mural can reflect a community since murals have traditionally been used as a communication tool by the community that creates them. As for the environmental angle, that’s where Heritage Conservancy comes in! Shannon Fredebaugh-Siller, our Community Engagement Programs Manager, has been teaching the students about land conservation, aquatic ecosystems, and the negative impact that pollution has on water quality. The kids have been enjoying learning about the native plants, trees, and wildlife found along the Delaware River while also appreciating that Heritage Conservancy works to preserve land along the Delaware River in order to protect the communities and ecosystems that rely on it. The students are being taught that art can serve as an advocacy platform and effect change, so they have been given the opportunity to express their own creativity with a cause. 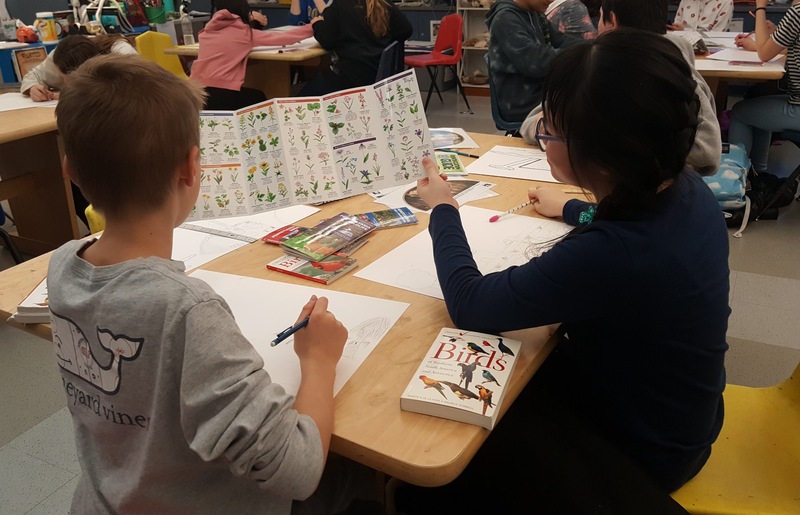 Their individual artwork will combine to become part of a collective mural, and when seen as a whole, the students’ masterpieces will convey a larger message of the impact that art can make in spurring further protection of the environment. The students have created some beautiful and profound pieces of advocacy artwork. Their poetic approach shows a deep understanding of the need to steward and care for our environment. It showed that the future is bright for the next generaton! The entire five-week long “The River Flows Through Art” program culminates at the end of March in a celebration of their work during an open house for all students and families of students who participated. The digital display of their collective mural will be exhibited at the Michener Art Museum through early summer. To further their environmental learning, a field trip opportunity will be given to all students to participate in hands-on field work at preserved sites protected by Heritage Conservancy. 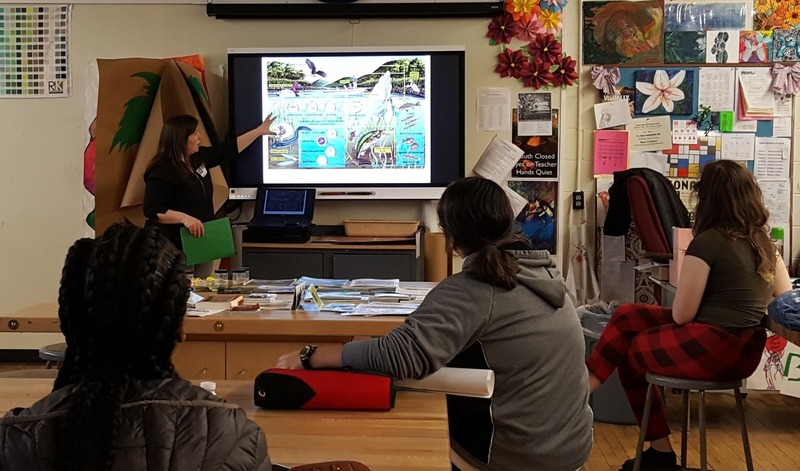 “The integration of art into environmental science learning has accomplished two things: science has become more accessible to students, and it has given then students a voice to express their concern to protect the environment,” says Shannon. It’s critical to connect kids with our environment so they develop an interest in protecting our natural resources, and it’s important for them to understand that they can make a positive difference in our community. Heritage Conservancy is proud to have partnered with the Michener Art Museum on this impactful, educational endeavor! Generous support for this project provided by Art Bridges.